This is the tuner kit which will require a custom tune done locally after you install the kit, and does not include a programmer, fuel injectors, or Flowcharger fuel setup. One of the most anticipated and talked about automotive line ups this year was the new 2015 HEMI platforms. With ProCharger superchargers being the undisputed forced induction leader for the HEMI platform, our engineers couldn't wait to get these systems ready for our customers. Well the day has come, so if you're ready to feel the rush that an extra 170HP can deliver, here is your chance! There are many different options available from ProCharger, please view the details section below for the details on this kit. For the many other ATI ProCharger kits available, and options such as upgrading head units or polished head units. WHAT TO EXPECT FROM THIS PRODUCT. All New Intercooler System: For years ProCharger air-to-air intercoolers for the HEMI/DCX platform have been the leader in HP support and effectiveness, but as always we continued to improve upon that. We designed an all-new system to have even more free flowing tubing arrangements, and less couplers then before. This is great news for those that will be pushing the HP levels down the road, which demand the best intercooler on the market. 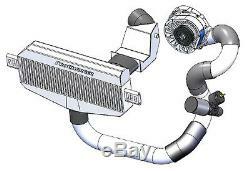 Above in the pictures you can view two different intercooler systems offered to meet our customers needs. Industry Leading Power Gains: For over a decade ProCharger supercharger systems have delivered the largest and most reliable power gains for the HEMI engine platforms. Power gains of over 170HP are possible on standard high quality pump gas. Easy Installation, with Reversibility: ProCharger engineering staff works hard to ensure that not only will your supercharger system be easy enough to install in the home garage with an OEM fit and finish, but also that it leaves no permanent changes to the automobile (such as cutting or trimming of body parts). Ensuring the piece of mind to easily install this system on the weekend, and know that you are not affecting resale or trade in value if you chose to remove it before sale. Horsepower gain: 170+ Satin Finish P-1SC-1 supercharger head unit, 7 psi standard, upgrades to D-1SC, F-1, F-1A, F-1D available Highly effective 3 core air-to-air intercooler All 3 tubing and ProFlo Bypass Valve Belt Drive System: Stock 6 rib Fuel Pump Supplied: Not Supplied Fuel Injectors Supplied: Not Supplied Computer/Ignition Mods. Not Supplied The coolest charge air temperatures and largest power gains available ProChargers patented and proven, self-contained oiling design requires no external oil lines Easiest and quickest installation System is 100% complete with OEM quality and appearance TREperformance is an Authorized Priority Dealer of ATI Prochargers. ATI / ProCharger Dealer information Procharger is very strict about who they allow as dealers. Procharger dealers must have experience with high performance forced induction applications and provide excellent customer service and application advice. Why choose ATI / Procharger Superchargers? ProCharger supercharger systems are absolutely the most powerful and reliable supercharger systems available for your vehicle. Intercooler ProCharger systems are able to reliably increase horsepower and torque by 50-85% while still keeping your vehicle emissions legal and allowing you to run pump gas. For street use or at the track, Intercooled ProCharger supercharger systems will deliver the largest increase in horsepower and torque available from any supercharger system. And thanks to the extremely low charge air temperatures provided by ProCharger technology, ProCharger systems also provide much better engine longevity by protecting your motor from detonation. ProCharger systems are designed with a fundamental understanding of the physics behind supercharging, and are engineered to the highest quality standards. Designed, manufactured and serviced in the USA. Superior Supercharger Technology Thanks to relentless innovation, ProCharger technology is generations ahead of the competition. ATIs self-contained (Part numbers ending in SC) ProCharger models are the first and only gear-driven centrifugal superchargers to feature self-lubrication, and contain the industrys most advanced technology. The exclusive, patented, self-contained, gear-driven superchargers eliminate tapping into your oil pan, run cooler and produce more power than any competitors products. The impellers are created with aircraft grade 7075 T-6 aluminum alloy for tremendous strength and performance. The top tier material used in the construction of every ProCharger billet impeller and compressor housing allows the use of higher step up ratios than the competition. This in turn allows increased boost levels and superior overall performance than other offerings on the market. We have ATI / Procharger supercharger systems to fit almost every performance application! We do not lower invoice values since it is a violation of US and International custom laws. Let us work to resolve your problem so everyone is happy. Suite D7 Costa Mesa, CA 92627. The item "Challenger Hemi 2015-18 5.7L R/T P1SC1 Procharger Supercharger Tuner Intercooled" is in sale since Tuesday, December 8, 2015. This item is in the category "eBay Motors\Parts & Accessories\Car & Truck Parts\Turbos, Nitrous, Superchargers\Superchargers & Parts". 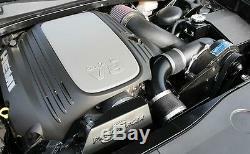 The seller is "treperformance" and is located in Costa Mesa, California. This item can be shipped worldwide.